The rings in the photos are sold. This listing is for a custom-made set of two rings. They will be similar in appearance to the rings you see here. These white gold bands have a much 'whiter' appearance in real life. The sun was quite warm while I took these pictures, so the gold is showing much warmer/more yellow than it does in real life. Reticulation is a metalworking process which creates an unpredictable, dramatic, and deep texture. It is done by repeatedly heating the metal to the point where the surface becomes molten and begins to flow. Then, the metal is quickly cooled, and re-heated. This process can occur up to ten or more times before the desired effect is achieved. The difference between my reticulated gold rings, and most other 'reticulated' gold rings, is I am actually reticulating the gold prior to forging it into a band. 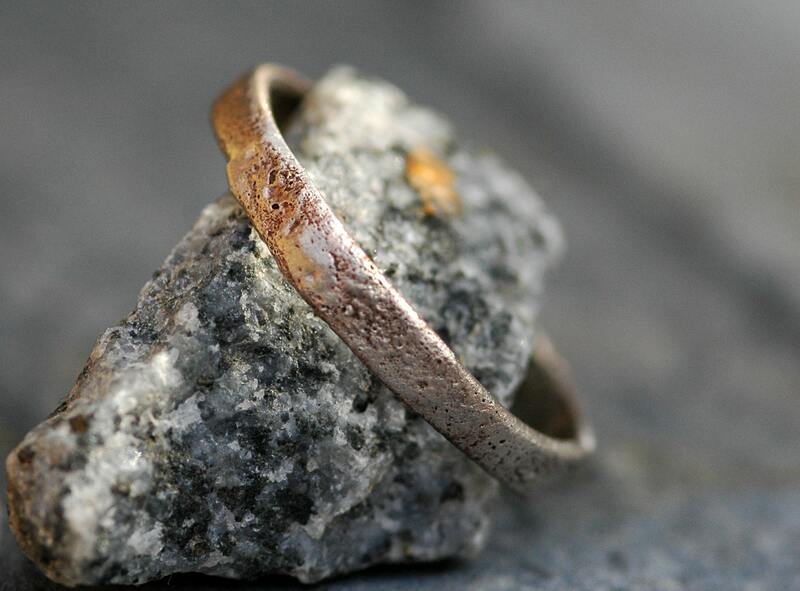 Most gold rings described as 'reticulated' are, in fact, castings made from an original of reticulated sterling silver. Gold is extremely difficult and messy to work with using reticulation. 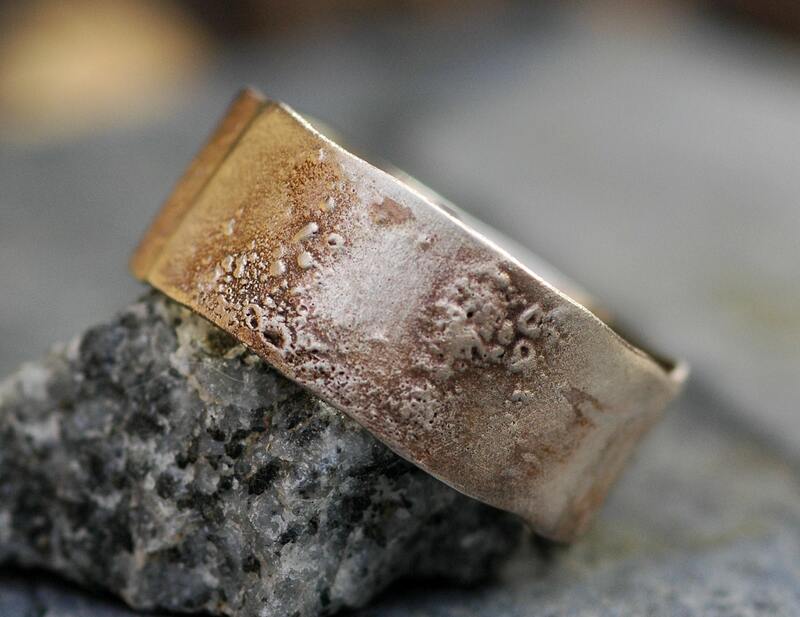 So, with my rings, you are seeing the first generation texture of the process, and not second generation castings. I begin these ring by reticulating a thick strip of recycled gold. Once I am happy with the way the reticulation looked, I forge the strip into a band. Please note that the seam area on this ring is apparent- because the texture is so deep and organic, there is no way to ensure a perfectly matched texture on both sides of the band. The seam, in my view, is a complimentary texture to that of the reticulated surface. This ring has a very organic form, and the edges are undulating. 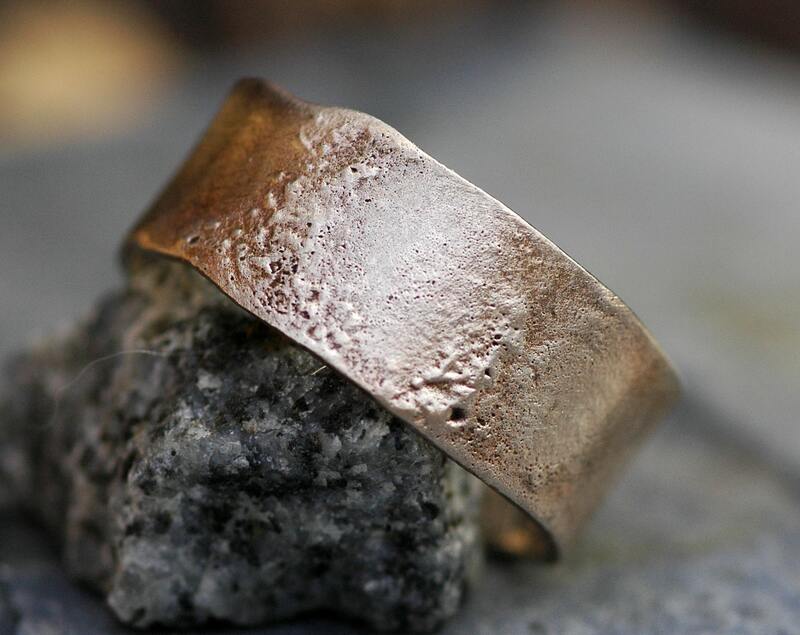 I have taken care to sand and polish any rough areas away from these edges- the ring is very comfortable to wear, and the edges will not irritate your finger. 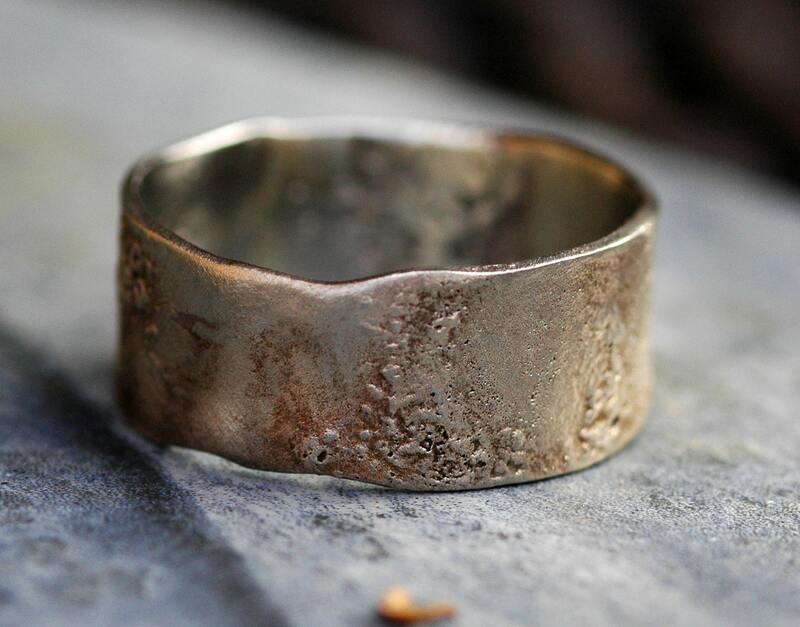 I am also able to create these rings in narrower or broader widths. The ring set you see here has a 10mm his band, and a 3mm hers band. Please note that, the narrower the band, the more textural the ring will become- a wider band creates a broad surface to heat, and it will not respond with as much resulting texture as a narrower band. The intense, prolonged heat of this process causes a heavy oxidization that builds up on the metal. 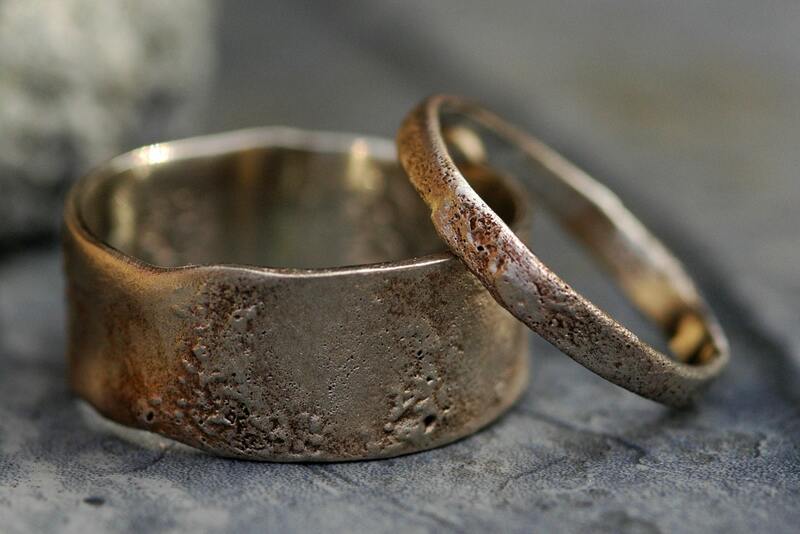 Much of the patina has been brushed back on these two rings, with a mild patina left- this highlights the texture of the rings.